The Agribusiness Council (ABC) is a nonprofit/tax-exempt 501(c)(3) organization founded in 1967 following a White House meeting between President Lyndon Johnson and Henry Heinz II, chairman of Heinz Foods Company. ABC's primary purpose is to promote more effective U.S. agribusiness engagement in global agricultural markets through trade and investment. ABC provides a range of start-up services to groups interested in organizing agribusiness associations - briefings, association business plans, mailing list development, staff training, access to national and international databases, and links to ongoing specialized ABC committees and other state councils. 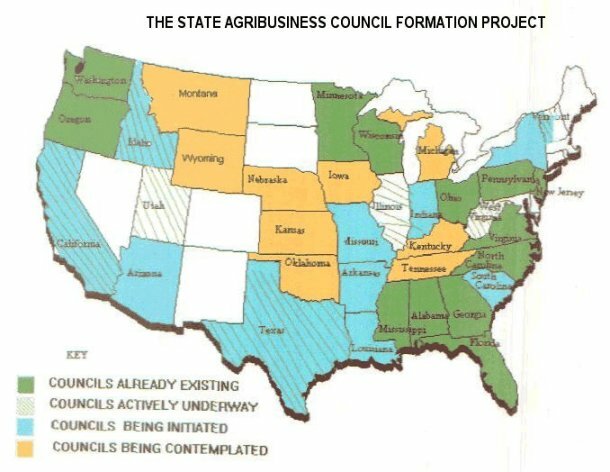 In 1989, The Agribusiness Council initiated the state agribusiness council formation project (S/ABC) as part of a broad effort to strengthen ties between grassroots agricultural interests and their allies in the "food system." Bipartisan support from thirty senators and representatives in the U.S. Congress helped launch the project. The S/ABC aims at forming new agribusiness associations at the state/local levels and linking them to the wider network of existing counterpart associations modeled after the Council. The network includes several overseas agribusiness associations and thus provides unique marketing and contact development potentials for participating companies, universities and associations. *Note: Alaska and Hawaii have no Councils at present. The Agribusiness Council (ABC) seeks funding to expand and refine its management/training programs which assist in the formation of local/state voluntary membership associations for the advancement of private sector-led solutions on issues affecting the agro-food system. These nonprofit associations would be designed around more successful state councils and ABC. Committees and programs, particularly on international trade/development, will take advantage of ABC’s global network and database. ABC support services and guidance will enable the nascent associations to achieve independence and sustainability, while forging new links for global food security. In 1993, ABC initiated the state agribusiness counterpart project (S/ABC) as part of a broad effort to strengthen ties between grassroots agricultural interests and the agro-allied "food system." Bipartisan support from some thirty senators and representatives in the U.S. Congress, beginning several years earlier on related ABC programs, confirmed high-level interest and helped launch the S/ABC project. ABC president N.E. Hollis traveled extensively in twenty-five states conducting workshops and making presentations to local audiences interested in starting their own agribusiness associations. Most of these visits were made on invitation with expenses covered by local organizers, universities, and/or interested state government agencies. As a result of these workshops, ABC, in cooperation with local organizers, has formed four state councils with another six underway. Interest in the S/ABC concept is strong and fueled by a growing realization in agriculture that government services and programs are being phased out – and more cooperation will be needed if U.S. agribusiness is to compete effectively in the global marketplace. In certain ag sectors consolidation of association interests make more sense (i.e., local seed, feed, agchem, and fertilizer associations may not have "critical mass" to maintain separate offices). Other nascent ag groups representing new technologies/uses may not have sufficient numbers to provide full service/issue coverage to their constituents. Moreover, as agriculture becomes more complex within this historic transition, there are numerous emerging issues which simply transcend an individual ag group’s grasp. For example, agro-environment, food safety, ag education, international trade, ag transport/destruction/ag research/new technologies, renewable energy and agriculture, ag finance and others reflect issues which involve numerous sectors within the food system. Traditional ag groups are often ill-equipped to handle multidisciplinary issues. Responses are negative, defensive and not well-crafted to win general public sympathy, or to provide science/experience-based information. With rapid declines in membership, many ag groups are increasingly reliant upon check-off funds and direct subsidies received from government. The result is increasingly reflected in a "bunker mentality" which is unhealthy for the ag sector at large. New communication channels needed for expression are sorely required to enable the majority of successful farmers, who are actually quite sophisticated businessmen, to project their ideas and solutions. At stake, in no small measure, is the future of world food security. The S/ABC will generate leadership and program benefits by providing regularized assistance to local organizers in the complex task of establishing a free-standing state or local agribusiness council. The S/ABC will improve the climate for cross-sectoral problem-solving through specialized committees and facilitate action through voluntary, not-for-profit councils. S/ABC will provide training in the establishment and management of agribusiness "umbrella" associations, as well as help groups to link up with the existing network of counterpart associations. Results will include increased information flow and contacts on new ag/food technologies to and from the grassroots to decision-makers. Formed after a White House meeting between President Lyndon Johnson and Henry Heinz of Heinz Food Company in 1967, ABC has developed considerable experience in starting/assisting counterpart agribusiness associations at home and abroad. In 1995, ABC sparked the formation of an indigenous and independent agribusiness association in Poland – now boasting more than 300 members with offices in several cities, including Warsaw, the capital. In the United States, ABC has jumpstarted state councils in Illinois, Florida, Washington State, and West Virginia in recent years, with others underway. In some cases, the process proceeds rapidly; in others, such as Poland, the formation project can take up to five years. Much depends on the comparable levels of local enthusiasm and resistance of more traditional groups to endorsing the S/ABC’s "umbrella" approach. S/ABC would utilize funding to develop a training kit and a directory of existing state councils as needed tools for the expansion of the network. Depending upon available funds, S/ABC would also undertake additional training visits and the design of a computer-compatible database access with existing councils, which would enable the freer exchange of information and contacts between state councils themselves and via the national ABC to the overseas network. S/ABC will also undertake to organize a national meeting of all state agribusiness association leaders with the aim of increasing cooperation and database link-ups on key issues affecting agro-food systems. S/ABC is partially supported in its work by voluntary contributions from leading agribusiness and ag-allied firms involved in different specialized/transcendent issues. For example, Walt Disney World/Epcot (new ag technologies), Boeing (geospatial information systems for ag/forestry applications), Deere (world food security summit), Seafirst/Bank of America (ag credit), SSA, Harborside Refrigeration (ag transportation/distribution), Harbor Branch Oceanographic (aquaculture/mariculture), Great Western/ConAgra, and many others. S/ABC needs untied funding support for training and other work which is not of priority interest to corporate donors, yet vital for project success. S/ABC will be financed through grants and private endowments as its programs reach further into the "food security" arena. Private funding will be essential to maintaining program independence from individual companies and/or government. Some funds can be generated from events and agreements with newly established state/local councils. $75,000 is targeted in 2000-2001. Agriculture in general, and U.S. agriculture in particular, are in transition, undergoing a revolution and radical down-sizing at the same time. New kinds of issues/challenges cutting across agriculture and the food system will require new types of solutions and coalitions working for agriculture’s interests. Agriculture and its traditional organizations are increasingly on the defensive and not well understood as urban populations grow and influence shifts from the countryside to the cities. Traditional ag groups – organized along producer, sector and geographic lines – are often unable to grapple with modern challenges effectively; and they resort to ad hoc coalition-building which is costly, slow and lacks continuity after crises abate. As agribusiness becomes more specialized and sector groups splinter into smaller units, "critical mass" is lost and difficulties arise in developing cohesive positions even around issues where broad common interests can be found. Effective coalition-building requires more framework, more "association discipline" to provide agricultural interests with "critical mass" and continuity. This favors a loose, but more formalized underpinning for success. Traditional ag groups are shrinking in number as their respective bases thin out, resulting in reduced political influence, and access to global market development opportunities. Traditional ag groups will resist supporting proposed "umbrella" efforts, and may attempt to sabotage, until it is clear that (a) their own policies and membership will be strengthened, (b) "umbrella" will not supercede or interfere with their lobbying activities, (c) "Umbrella" will provide incremental benefits justifying support. Thus, traditional ag is inclined to "fence-sit" in early development stages which can allow "fresh ideas/people" to flow into the formation of "the umbrella." Individual managers of traditional ag associations (as distinct from their "practitioner" members) and other "ag elites" usually feel threatened by the emergence of a new ag "umbrella" association, and their concerns should be recognized. Major ag producers and agribusiness companies may also adopt a "wait and see" posture since they rely upon #9 for advice and are often quite bureaucratic, with individual executives practicing "risk aversion." Their early avoidance of commitment/participation offers the emerging "umbrella" leadership a unique chance to attract new people/ideas. If the statutes are created with a sensitivity to the inevitable power dynamics of "big agribusiness," the new organization can emerge as a truly balanced one with a grassroots constituency linked to urban, agro/food-allied interests which can forge new links for the state’s food system as a whole. Modern telecommunications and transport technology allows the emergence of these type of ag organizations – with private sector, nonprofit foundation – for the first time. Networks without the component of association trust are already becoming dysfunctional, but properly managed association association-based networks, with counterpart groups domestically and abroad, have a great future since they can provide business benefits and share problem-solving ideas among members. Associations in agriculture have specialized requirements and governance mechanisms based upon character and trust which can serve them well in the competition for resources and ideas. Associations have comparative advantage over certain public sector activities and could supplement government in a era of downsizing. Agricultural advisory groups, often staffed by state and federal agencies do not provide a level playing field, or channels for constructive criticism or change, which could benefit the food system as a whole and/or inspire general public confidence. Private enterprise is willing to finance nonprofit organizational "umbrella" programs to supplement state and federal functions IF they are able to participate and influence activities of associations in a meaningful way. Agribusiness councils are well-positioned, with a growing national network, to introduce programs to enhance the image oaf agriculture and the professionalism of all links in the "food system" working together – above the age-worn frictions and suspicions which will continue at the various economic pressure points in the value-added, distribution and retail end of the chain. Agribusiness councils are well-positioned, with links to a growing international network of counterpart groups, to introduce cost-effective market development and information programs, which build upon human nature/desire within association channels to meet and build ongoing activities based upon presence, mutual respect and shared interests in the globalization of agriculture and the parallel search for world food security. Agribusiness councils are well-suited, with a broader scope of activities, to attract support from non-agricultural industries which depend upon the agro-food system. For example, banks, transportation, natural resource, power companies, food retailers and restaurants – all have important links to the producer community – and appreciate a chance to improve communications. They also value the opportunity to help reduce infighting within ag groups and thus, "help ag to help itself." As signaled in the Freedom of Farm Act, recently signed into law, government is phasing out of agriculture. Increasingly, private enterprise will be making its own decisions regarding what to plant and process for a world market. The private sector will need to strengthen its own marketing and info-gathering networks to perform in the 21st century. There are other points which can be added, and some will prompt argument in different locations, depending upon the state and its existing ag organizational structure. The important message is simply that we can be better! While facing the challenges of the rapidly changing economy and society of the 21st century, characterized by the globalization phenomenon, we must do better with the God-given resources of our agriculture and overall food system. New ag organizations, such as agribusiness councils, will not be a panacea for agriculture’s many problems, but their emergence reflects a search for positive action. With a demonstrated track record, agribusiness councils have an important edge: they work! Since the process of formatting effective nonprofit associations is a specialized one, often requiring time and plenty of hard work, there is a premium on ACTION. There will be inertia to overcome and hostility from elements of the "dug-in" status quo, so let’s not waste any more time. It is our destiny to succeed in the 21st century, especially in the agribusiness arena, so let’s get up to the front on the double-quick, and work together!